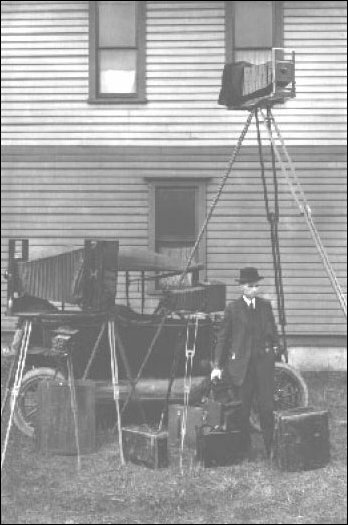 Taken after he moved from Sedro-Woolley, this photo shows Kinsey, his photos and the Flivver Model-T into which he fit them. When it came to capturing on film in amazing detail the splendors of the deep woods and colorful characters that inhabited them, we think Darius (Dee) Kinsey was without a peer. And considering the vagaries of poor light in the tall timber and his primitive equipment, his accomplishments are all the more remarkable. His works are scattered all over the Northwest, and farther. 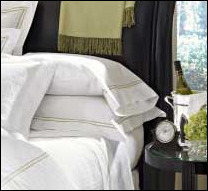 They appear in countless family collections, magazines, and books. You will find them spread through the History of Skagit and Snohomish Counties. About 200 of his best appear in "This Was Logging," a most interesting and worthwhile book, and more in others put together by Ralph W. Andrews. While Kinsey was still active, loggers bought his pictures by the hundreds. The first of this scribe's family photographs after coming west were snapped in his studio in Sedro Woolley. Darius Kinsey was born in Marysville, Missouri, in 1871. Early in life he exhibited artistic tendencies and tried to satisfy this urge by taking up sketching. He had a brother Alfred who had settled at Snoqualmie and his letters lured Darius to the Pacific Northwest at the age of 20. Upon his arrival he was bug-eyed at the logging, shipping, land clearing, town building, and other developments of this bustling new country, and the urge came upon him to record it. Though sketching was his first love, cameras were becoming popular and realizing that he could reproduce the scenes around him more faithfully and faster by photography, he laid aside his crayons and turned to the camera. He was on his way. At first, feeling his way cautiously in the business, his work consisted mostly of taking family group and wedding pictures. Once he made the long trip to Nooksack to photograph the Pritts family, and there met romance. On October 8, 1896, at Nooksack, Darius Kinsey and Miss Tabitha (Tib) Pritts stood before a minister and said the necessary words. He was 25 at the time. After a tour of Sound cities, the young couple settled in Sedro Woolley. They built a home on Talcott Street (now torn down) complete with a sky-lighted studio. He took any kind of work that came to his shop and anything else that was photogenic and unusual in the field. Indians, hop fields, ox teams, hauling logs and shingle bolts over skid roads goaded by tobacco squirting, swearing drivers, floods, sections of picturesque up-river pack trails, and what have you, creating a picture dictionary of just how things looked then. 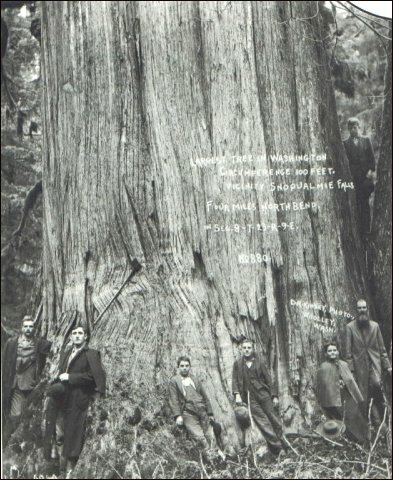 Handwritten caption: "Largest tree in Washington. Circumference 100 feet. Vicinity Snoqualmie falls. Four miles North Bend. Section 8, Township 23, Range 9 East. No. 880." Dating from 1897, one of his earliest photos shows the style and composition that would make Kinsey's photos famous keepsakes. He sallied forth into just about every logging operation in the country to catch the loggers at all types of woods work, and the ever-changing phases of machinery and methods. It is hard to visualize in this day the hardships this entailed. Though a small man he was blessed with a tremendous amount of energy, and he needed it. 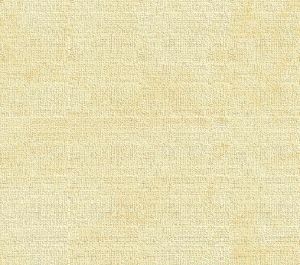 At first he traveled by horse and buggy with his gear over muddy or dusty, almost nonexistent roads as far as he could. Then he would catch a gas speeder into camp if he were lucky, or hit the trail on foot carrying his heavy camera (that elevated to height of 14 feet), the old-fashioned glass plates that weighed out at 25 pounds to the pair and other necessary equipment. After that came the task of setting up in the woods and sometimes having to build a scaffold to obtain the proper perspective, for he was a perfectionist. Later on, he used improved, lighter cameras and traveled by automobile. Meantime, his good wife who had learned the technical art of developing, presiding over a beehive of labor at home in the studio processing the plates that her husband had sent back from his field work while he traveled on to take more. At one time she had as high as 16 people employed when a rush came on. For many years after this he still made the camps in this area. In 1940, after making arrangements to take a series of pictures in a logging camp he fell from a stump the first day and broke some ribs. This was his last job in the woods. The next five years, after his recovery, were spent in taking views and marketing the prints for stereopticon purposes. He died in [Sedro-Woolley on May 13, 1945,] at the age of 74. During his residence in Sedro Woolley, he was superintendent of a Sunday School at the near-by church. He was a deeply religious man, scorning the use of tobacco and liquor, and never worked on the Sabbath. Though somewhat strait-laced, he got along well with the loggers. In fact, they enjoyed his ready wit and visits. He could have made more money by working strictly as a commercial artist, but his inborn artistry and affection for the human elements that he photographed stubbornly refused to be sidetracked. And we are the richer for that. If you want to learn more about Kinsey, we suggest that you read: Dave Bohn & Rodolfo Petschek. Kinsey Photographer (A half century of negatives by Darius and Tabitha May Kinsey). San Francisco: Chronicle Books, 1975 and 1982. Kinsey was the finest artist that Sedro-Woolley produced and his photography has become a symbol for the days that brawny men felled the forests of the Northwest counties and locomotives carried them to market. The authors record Darius and his partner/wife Tabitha and their family in Volume I, with the help of their daughter Dorothea. In Volume II they worked with Darius Jr. to present some of the finest of the 4,500 negatives that miraculously survived the decades from 1905 to 1975. After seeing the results of the authors' work, it is difficult to understand the indifference of publishers who could not see the value of the Kinsey collection until these two fine men showed them. Volume III: the locomotive portraits, contains the photos of trains that Darius chased into the wilderness and forest, with an assistant lugging hundreds of pounds of equipment behind and Tabitha back home in the darkroom on Talcott street. In future issues, we will also shine a light on the Kinsey brothers and some of their descendants, who showed some of the same creative spark and business acumen and self-discipline that Darius displayed. Alas, we in the Northwest benefited as one gallery, institution and publisher after another passed on the Kinsey collection in the 1970s. We have this richness in our back yard and can access it directly. Thank you, Dave and Rudi and the people in Bellingham who came through in the crunch. An introduction and overview to Darius Kinsey and his immense photo collection, from Missouri to Mount Si to Sedro-Woolley to Seattle, and, after his death, to California and to Bellingham. Includes the Whatcom Museum of History & Art Kinsey/Biery/etc. collections. See links there for all Kinsey features. We are proud to announce that later this year, we will provide a definitive profile of nuclear unit of the Kinsey family and how the different brothers and descendants fared. There were many brilliant people in that family, and an argument can be made that Clark Kinsey had equivalent talent to Darius, and matched him at times in results. And the story, derived over nearly a decade from correspondence with Kinsey descendants who want the whole grand picture to be snapped, will lead you to places that might not associate with the Kinseys, including Gorst Aviation. Vern Gorst met Clark Kinsey in the Klondike gold fields and established his air business at Duwamish, at the end of Ivar's old pier on Elliott Bay and then launched seaplane service from Lake Union in the 1920s. Gorst shared the successes in those first days of expanded air service with another Northwest aviation pioneer, Bill Boeing, and Vern is credited with establishing the initial foundation of what would become United Airlines. And one of Clark's descendants was a key player in the Gorst era and following. Quite a panorama, which will be shared with our online-magazine subscribers (now in Issue 57) first (that's a hint).